Discussion in 'iPhone and iPad Games' started by killercow, Aug 17, 2016. 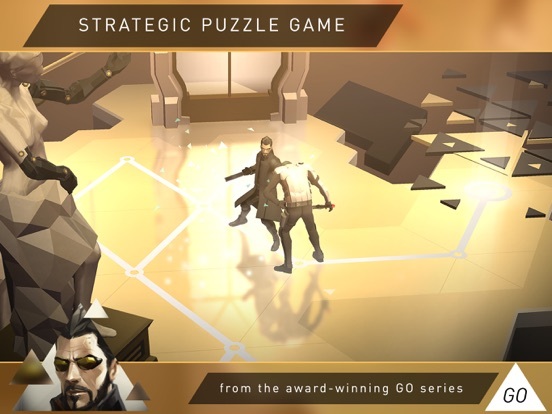 FROM THE MAKERS OF AWARD-WINNING HITMAN GO AND LARA CROFT GO COMES A NEW ADVENTURE Deus Ex GO is a turn-based puzzle stealth game set in a beautiful dystopian future. 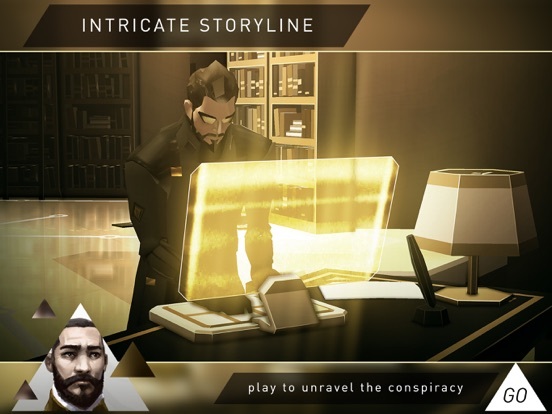 Take control of secret agent Adam Jensen and solve brain teasing, grid-based puzzles to infiltrate enemy lairs and unravel a perplexing new mystery. 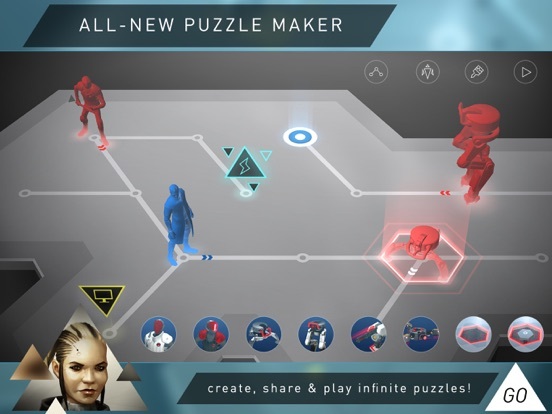 Sneak, hack and fight past enemies, and augment Adam with futuristic upgrades. 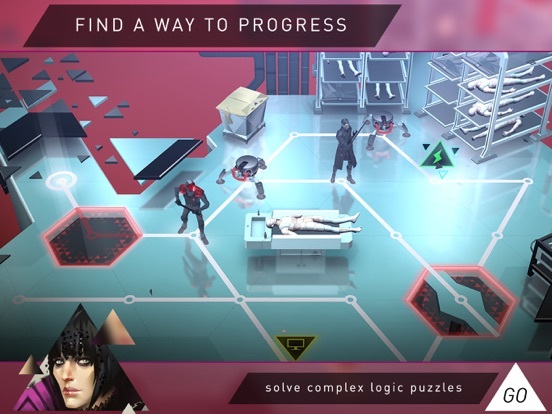 NEW - Expand your adventure with infinite brain-teasing content and new modes! 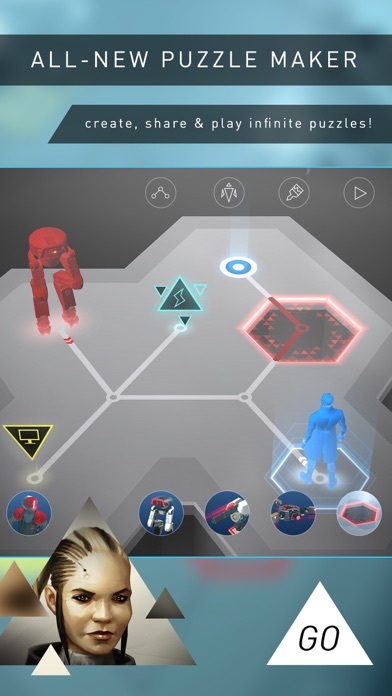 • Create and share your own challenges in the elegant Puzzle Maker • Play community levels curated by your play data • Experience infinite brain-teasing challenges in Infinite Play Deus Ex GO features: • An engrossing story with over 50 challenging puzzles • Special events with daily challenge levels • Unique hacking powers – Take over enemy turrets or change the layout of the level itself • Augmented puzzles – Solve puzzles using Adam’s iconic augmentations • Intelligent new enemies including guards, turrets, drones, walkers and more • An intricate and mysterious storyline set in a beautiful vision of the future Following Hitman GO & Apple’s iPhone Game of the Year 2015, Lara Croft GO, Square Enix Montréal brings yet another beloved franchise to mobile with this unique take on this near future dystopian world. Can you solve the mystery? 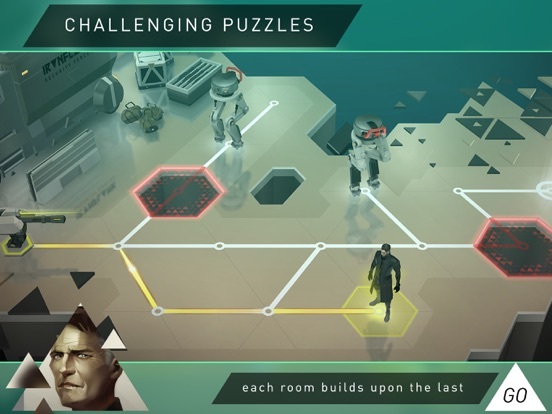 Take control of Adam Jensen and watch the puzzle unravel! 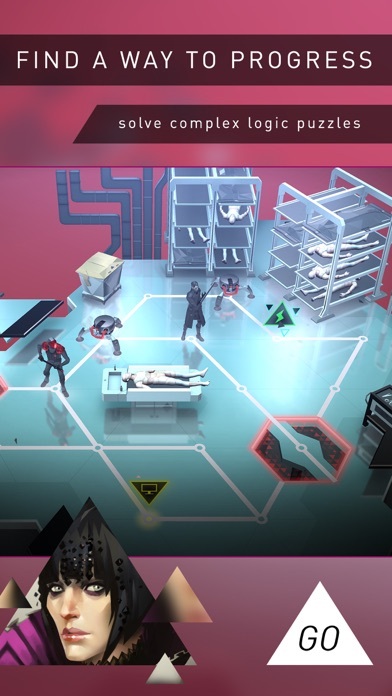 Please note: Deus Ex GO is not compatible with the iPhone 4. That's what puzzle games are, though. I am not a fan of puzzle games either, but Tomb Raider go is one of my favorite iOS games ever. Really captured the feeling of Tomb Raider in a puzzle game format. 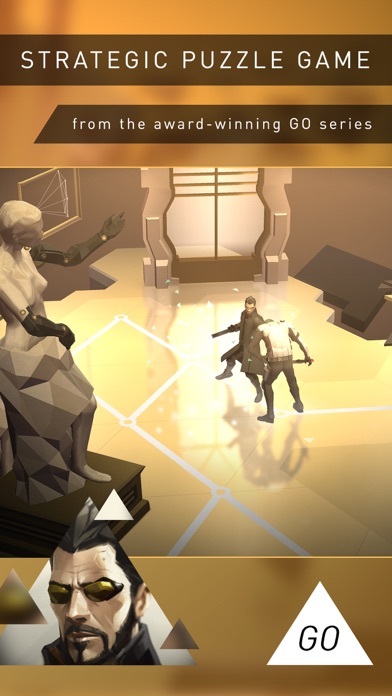 I also like Hitman go, but not nearly as much as Tomb Raider. If you're talking about replay ability, they mention in the description that there will be a new puzzle EVERY WEEKDAY. So after you finish the campaign there is still content coming in. Any idea when it hits Android? As with the other GO games, this is fantastic...yet unlike the others, this just takes up 250 MBs. Too early to tell what mechanics come into play later on, but it's safe to say that Squeenix have yet again taken a well established series and turned it upside-down into something that suits mobile like a glove. One thing to note though is that it seems to use up quite a bit of battery. OMG should be awesome on my iPad Pro 12.9"
Bought, will play it tonight!! Both games before were polished and on point. I can only recommend it. I personally prefer hand-crafted puzzles over randomized, but I get what you're saying. Another fantastic game in the Go series. 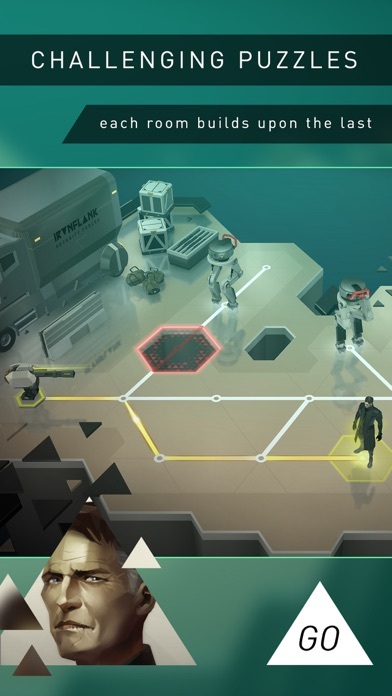 Deus Ex Go is more story driven than the other 2 games and it has a max number of moves system to gold the levels. 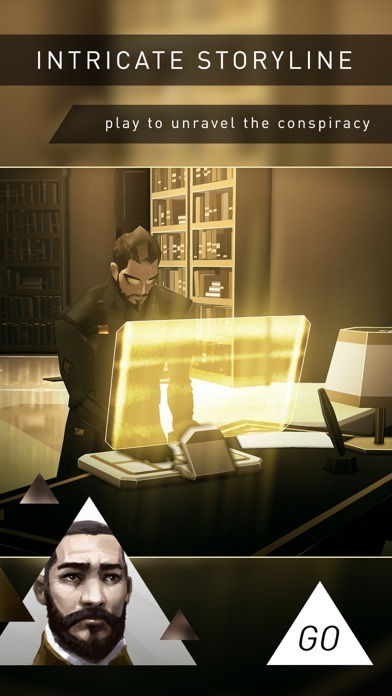 As someone who never played a Deus Ex game I'm missing knowledge of the backstory that's pretty much needed to enjoy the story of this game. It's harder than Lara Croft Go. I'm currently on missions 35/50 and I think it's the shortest game in the series, but there's a level editor. The consoles and levels and sometimes a bit fiddly, but that's far from getting too annoying. Thanks, touchy85, for the impression. Glad to hear about a move counter and the increased level of difficulty compared to Lara Croft Go. Will give this a game now. When can we expect Pokemon GO ? It also has daily levels which is really neat and it looks like the level editor is not available yet. Loved the first two games and this looks awesome too, just played three levels and love the whole atmosphere, great stuff, I am gonna play one level a day so it will keep me longer.